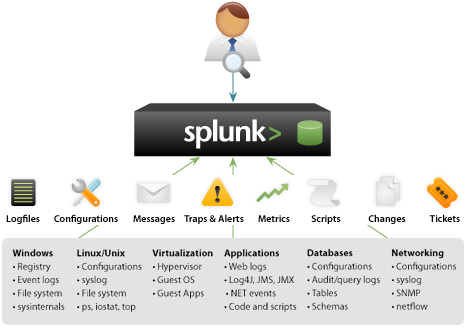 Splunk is powerful and versatile IT search software that takes the pain out of tracking and utilizing the information in your data center. If you have Splunk, you won’t need complicated databases, connectors, custom parsers or controls–all that’s required is a web browser and your imagination. Splunk handles the rest. Automatically discover useful information embedded in your data, so you don’t have to identify it yourself. No matter how you get the data, or what format it’s in, Splunk indexes it the same way–without any specific parsers or adapters to write or maintain. It stores both the raw data and the rich index in an efficient, compressed, filesystem-based datastore–with optional data signing and auditing if you need to prove data integrity. Now you’ve got all that data in your system…what do you want to do with it? Start by using Splunk’s powerful search functionality to look for anything, not just a handful of predetermined fields. Combine time and term searches. Find errors across every tier of your IT infrastructure and track down configuration changes in the seconds before a system failure occurs. Splunk identifies fields from your records as you search, providing flexibility unparalleled by solutions that require setup of rigid field mapping rulesets ahead of time. Even if your system contains terrabytes of data, Splunk enables you to search across it with precision. Any search can be run on a schedule, and scheduled searches can be set up to trigger notifications or when specific conditions occur. This automated alerting functionality works across the wide range of components and technologies throughout your IT infrastructure–from applications to firewalls to access controls. Have Splunk send notifications via email or SNMP to other management consoles. Arrange for alerting actions to trigger scripts that perform activities such as restarting an application, server, or network device, or opening a trouble ticket. Set up alerts for known bad events and use sophisticated correlation via search to find known risk patterns such as brute force attacks, data leakage, and even application-level fraud. Splunk’s ability to quickly analyze massive amounts of data enables you to summarize any set of search results in the form of interactive charts, graphs, and tables. Generate reports on-the-fly that use statistical commands to trend metrics over time, compare top values, and report on the most and least frequent types of conditions. Visualize report results as interactive line, bar, column, pie, scatterplot and heat-map charts. The first time you use Splunk, you’ll probably start by just searching the raw data to investigate problems — whether it’s an application error, network performance problem, or security alert. Searching in Splunk is free form — you can use familiar Boolean operators, wildcards and quoted strings to construct your searches. Type in keywords, such as a username, an IP address, a particular message… You’re never limited to a few predetermined fields and you don’t need to confront a complicated query builder, learn a query language, or know what field to search on. You can search by time, host and source. If you’re in the Welcome view, select Launch search app. If you’re in Splunk Home, select Search. This takes you to the Summary dashboard of the Search app. For more information about what you will find in the Search App. This search returns all events that have the terms "HTTP", "client", and "error" and do not have the terms "403" or "404". Once again, the results may or may not be exactly what you want to find. Just as the earlier search for http 404 may include events you don’t want, this search may both include events you don’t want and exclude events you want. The simplest beginning search is the search for *. Because this searches your entire index and returns an unlimited number of events, it’s also not an efficient search. We recommend that you begin with a more specific search on your index. When you index data, Splunk automatically adds fields to your event data for you. You can use these fields to search, edit the fields to make them more useful, extract additional knowledge and save them as custom fields. For more information about fields and how to use, edit, and add fields. Field values that exactly match "foo". Field values that don’t exactly match "foo". Numerical field values that are less than x. Numerical field values that are greater than x. Numerical field values that are less than and equal to x. Numerical field values that are greater than and equal to x. Note: You can only use <, >, <=, and >= with numerical field values, and you can only use = and != with multi-valued fields.